My name is Francesco De Cristofaro, or 'Franco' for short. I am an Italian from the South of Italy, and at 13 years old I emigrated to Venezuela. I became fascinated with magic after seeing a live performance by a magician during the interval at a Cinema in Venezuela. The magician asked for the assistance of a young boy and as I was the only young boy in the audience I excitedly ran up to help. He performed a trick using a metal funnel and, directing the spout towards my ear, milk was poured in much to the amusement of the audience, but nothing came out - the milk had vanished! Moments later he made it reappear, but fortunately not all over me! It was so unbelievable and from that moment on I was hooked on magic. 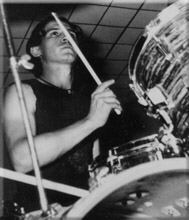 Magic remained a mystery and growing up I took up the drums instead. Playing with a band called "Los X 5" we enjoyed great success, made records and appeared on television many times. Ten years later I went back to Italy, and then later on settled in London. I Played with different English bands, in many places, and used to visit London's Covent Garden. 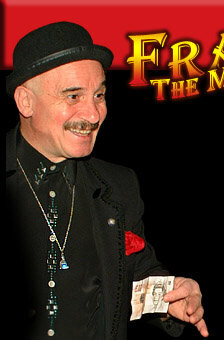 It was there that I saw two magicians, Duncan Trillo and Leo Ward. I'd often watch these two guys with great skill in magic. This rekindled my interest in magic which I've now been performing for 20 years. I love magic and especially entertaining people with it. 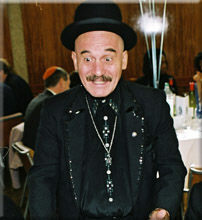 I've now performed in many parts of the world with great success, bringing laughter and fun to people with my magic.